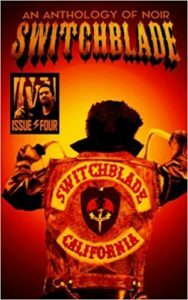 My first venture to the dark side of short fiction is in the current issue of Switchblade: An Anthology of Noir. Let me take you to the seamier side of Harrisburg, Pennsylvania where we watch a wager with life-or-death stakes play out in “Organ Trade Off”. You can buy Switchblade in paperback or as an ebook from Amazon.